The best species of Anemone; esp. if tank produced... But still need "reef system conditions"... High, steady pH, spg., alkalinity, alkaline earths. Put another way: Established, optimized, stable conditions suitable for touchy corals. tentacles in it's mouth and sucking the ends out of the tentacles and pulling long strings out of them this seems to happen frequently and now the anemone although it expands well used the tentacle pattern is now irregular and half of the anemone has short fat tentacles. It still eats and is under high powered led it grew and thrived under. I'm not sure what the cause is (possible bacterial infection) as the system is just anemones and 3 fish so rules out chemical warfare. I cannot find an answer anywhere and I'm extremely knowledgeable on this particular anemone. It is literally chewing off the end of it's tentacles. Thank you for your response. If i could just pick your brain a bit more and get a little more clarity on the issue. Firstly have you observed/heard of this behavior of a bubbletip taking it tentacles to it's mouth and extruding filaments which it seems to digest? If so what is the purpose of this? Is there any benefit to the animal? The only thing that comes to mind is it's feeding of the Zooxanthellae or rearranging the population or it's starving. The next question is you say it may be old tank syndrome. What gave you the impression? Rearranging the rock kicking up detritus? The reason I'm asking is to prevent any other anemones from declining. I have heard people say "old tank syndrome" (By no means in regards to your earlier response) when they can't pinpoint the root of a problem and have come across different theories as to what old tank syndrome means. Anywhere from excess nutrients built up in rock and substrate leaching back into the system to and imbalance of elements or bacterial populations. I am religious when it comes to water changes and this system get at least 10% weekly and clarification on this will tell me the best way to proceed and prevent healthy anemones remain that way for as long for many more years to come. Once again thank you for you time and knowledge. One last question In the cases you are aware of does the decline Spell the end of the animal or can this be reversed and a healthy specimen or is my anemone doomed no matter what i do. Sigh. I know my tank is too small (only 28 gal. I wish I had been told this prior to purchasing & making creature miserable, if not outright murdering it). I have a JBJ PRO model with LED lighting: daytime, dusk/dawn & moonlighting Specs list daylight as 25x3 watt 14 k; dawn/dusk: 4x3 watt 466nm; moonlight: 2x1 watt 456nm, so although my star polyp has grown 5 times original size in 4 months, my RBTA looks terrible: has not moved since finding its place on a live rock; bubble tips have shrunk & are dark looking, although lately they seem to be on the mend, or at least are not black! I have included a pic. Don't mind the hair algae as I have replaced my skimmer to an AquaMaxx HOB which does a brilliant job! Do you think I can save this little, miserable guy, or should I give him back to the store from whom I purchased it & perhaps they can help it mend. First off, Happy New Year!! Secondly, I have a sickly BTA that I bought about 2 months ago from Liveaquaria.com . 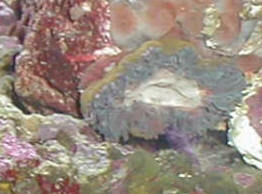 The anemone originally found a rock crevice where it seemed to do well for the first few weeks. I did not do a very good job target feeding it. The BTA then moved further into a hole in the rock & has been "on the move" since then. It is deflated, very small, with mouth open & tentacles retracted. It keeps moving slowly from rock to rock and has not opened up or inflated for about a month. The system is a 90g with a 40g refugium. Circulation pump is Rio 3200. There are 3-600 gph powerheads - 1 directed from back to front in the center, 2 directed toward each other from each side, all about 4 inches below water line. Filtration is with a Turboflotor Blue skimmer, filer sock, and carbon in a reactor. Lighting is provided by 4 x 48" T5s: two white, 1 purple, 1 actinic. Most of the rock work is about 12-16 inches from the lights at the highest point of the rocks. The BTA is currently located toward the lower part of the tank, which would be about 8" from the tank bottom & about 20" from the T5 bulbs in the canopy. The BTA does not seem to move up toward the light. At night with the lights off (except for moon lights) the BTA reaches upward, tentacles still retracted & mouth open. When feeding it Mysis or small pieces of shrimp the BTA will not "grab" the food (no tentacles) and the food floats away. Tank-mates are: 2 yellow tail damsels, 1 yellow sailfin, 1 Ocellaris about 3" long, 1 pajama cardinal, a few Mexican turbo snails & red-legged hermits. 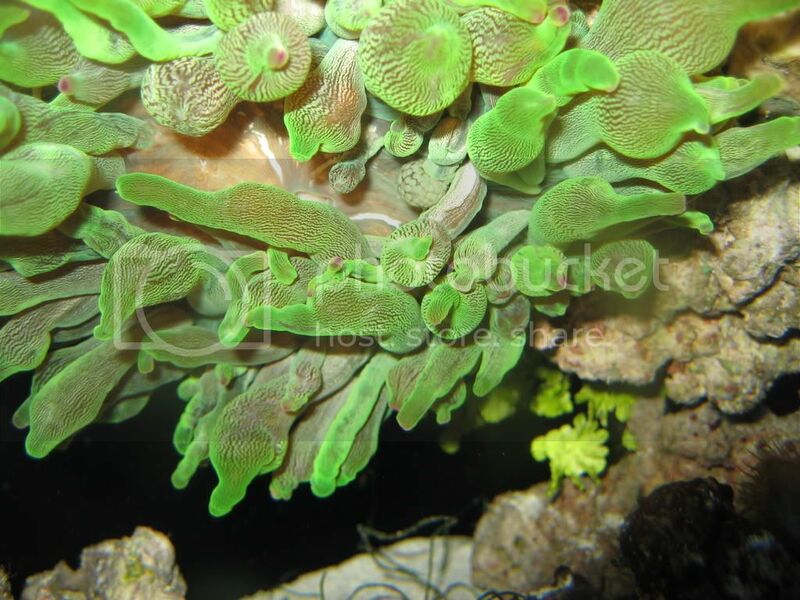 As for cnidarians: several very large green encrusting Montiporas, literally hundreds of green Corallimorphs located on most all of the rocks, 2 species of Rhodactis, a few Ricordeas, 2 Zoanthid colonies. Right now, the BTA is wedged into a rock crevice near some mushrooms. Ammonia=0. I use Salifert tests for all but Phosphate which is tested with a Hanna photometer, and nitrate which is tested with LaMotte high sensitivity reagents. Any ideas about how I can help my little BTA? I see a lot re: how to reduce nitrates, but not increasing them. Is this as simple as feeding more & reducing skimmer production? In attempting to move the BTA it floated behind the rocks & I am trying to find it again. When I do, you recommend removing from the tank & re-acclimating if I read your response correctly? Your site is fabulous. <Thank you.> Great (needed) information. Can you help. I have 30 gal eclipse system that I have removed the fluorescent fixture and now use a CoralLife 130w fixture. I have about 75lbs LR, 3" sand, 1 powerhead with undergravel filter and use the eclipse filtration system. As for as fish, I have 1 clown, 1 lawnmower blenny, angel (don't know what kind), 1 blue damsel. I also have a cleaner shrimp. My system is about 1 1/2 yr old. I do not have a skimmer. I change 5 gal water with distilled water every 2 weeks. I have been rotating between phytoplankton and ZooPlex (Kent) every 3 days. I feed the fish formula 1 & brine shrimp. Feeding small amounts twice daily. I have been supplementing with coral Accel (Kent). I only test Ammonia, nitrates, nitrites, & PH. All are excellent, with PH being 8.0. My question involves my BTA which is about 8 mo.s old. It used to open large to about 4 inches. It hasn't done this for quite some time. It now spends more time as you see in attached photos. It used to respond quickly to hand feeding (small pieces raw shrimp), and was also "sticky". Now it won't take food. It has done so well for so long that it's condition now has got me baffled. I'm hoping the attached photos will give you some clue to help me.